Bhutan lost to Oman during the Asian Cup Qualifiers at Sultan Qaboos Sports Complex, in Muscat, yesterday. 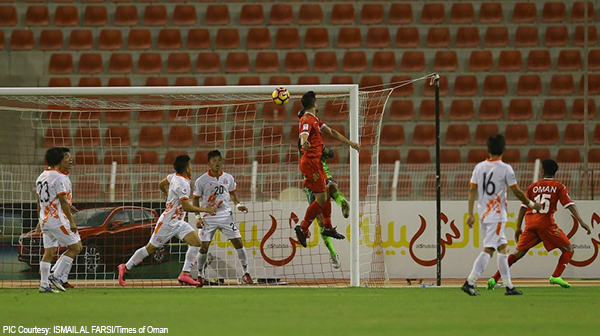 Bhutan had zero goal while Oman had 14 in its kitty (0-14). This has led to profusion of mixed opinions from ardent Bhutanese soccer fans. The defeat was like a swallowed bitter pill for them. But, they still have pinned hopes on Dragon Boys. “We haven’t developed at all. Yesterday when we conceded 14 goals, I was surprised. I thought we might concede five goals. I hope the team performs better in the future,” said a football enthusiast, Sangay Wangdi. Likewise, other football enthusiasts were disappointed with Bhutan’s performance. “Yesterday’s match was yet another eye opener for our country. Oman without doubt is at a better place compared to Bhutan in terms of football and other developments but we did not expect that Bhutan would lose with such a huge margin,” said another football fan, Anju Gurung. However, fans of Dragon Boys at home are optimistic that the team will play better in upcoming matches. “Bhutan lost to Oman 14-0, but then we the Bhutanese are not disheartened. I hope from here on Bhutan will be able to play better than this,” said football lover, Namgay Dorji. In a bid to book a place in the 2019 AFC Asia Cup to be played in the United Arab Emirates (UAE), Bhutan will face the Maldives in June. Though, the Maldives lost their opening group game to Palestine 3-0, yesterday, recent history between Bhutan and the Maldives has shown the island nation to be the better player.